Twin Valley Co-op has announced plans to close the hardware store and gas bar in Elkhorn as of Jan. 31, 2019. After a community meeting Thursday night, the board may take a closer look at the decision. Twin Valley Co-op’s board will take a closer look at the decision to close the gas bar and hardware store in Elkhorn after a community meeting on the planned closure of the store. Twin Valley announced October 5 that it would be closing the Elkhorn hardware store and gas business January 31 of next year. The Elkhorn Chamber of Commerce organized a meeting Thursday, October 18 to give community members a chance to find out more about the decision. Following the meeting, Twin Valley GM Dwayne Moncur said he thought the meeting was positive. “The community this evening showed just how passionate they are about what’s happening here, and what may be happening in the future. I thought it was a fabulous meeting, I really did. Moncur said he and the board heard the concerns from the community. “What I heard is they certainly don’t want to see that location close. We will take it back to the board and we’ll have a look at it, but we need some feedback from the people here as to what they’re looking for. We don’t have all the answers. At least now everybody knows there’s a concern, and we do have some issues. We need to do what we can to make things better. “We’ll go back and discuss it. Maybe we halt this and maybe we don’t. As I’m thinking about this, if we stay open, there will be some wholesale changes in that hardware store. It won’t look like it does right now. He said that Twin Valley makes money overall, with agro and petroleum being the most profitable divisions, and some of the food and hardware stores operating at a loss. Mark Humpries of the Elkhorn Chamber of Commerce said following the meeting that the next step for the chamber is to take a survey in the community and find out what people think is important. 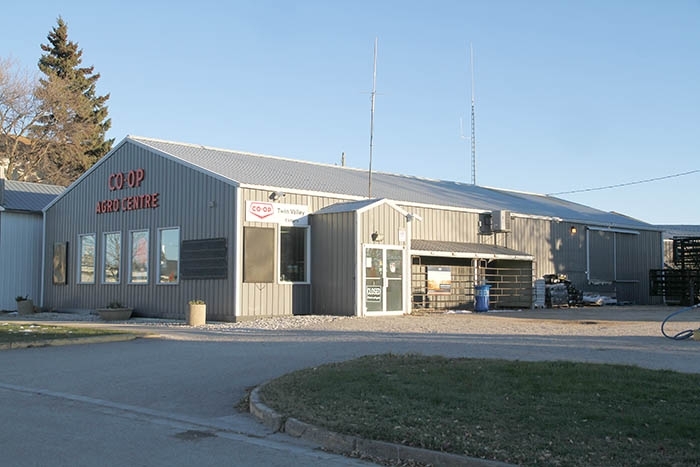 During the meeting Moncur said sales have been down at both the food and hardware stores in Elkhorn, which he said may be related to the opening of a large new Co-op food store in Virden, and a large new Co-op home centre in Moosomin. He said sales at the Elkhorn food store are down 7.2 per cent year to date, and the food store has lost $83,000 year to date. Moncur told the crowd that the Co-op hasn’t always received full support from the community. “Over the last while there have been a whole bunch of new homes built in Elkhorn,” he said. “We never got a chance to bid on supplying anything for them. There must be $2 million worth of homes, some very nice homes in Elkhorn that we never got a chance to provide anything to. He said the Elkhorn hardware store would need vastly greater sales to be profitable. He said the Agro location in Elkhorn makes a profit, but not enough to offset the losses at the other two Elkhorn locations. Moncur said during the meeting that community members’ commitment to support the co-op if it retains the location may not last. Mark Humphries took issue with that. “You said we will support it for a bit and then it will drop off,” he said. “This town isn’t one of those towns. If they think they might lose something they will fight for it. In response to a question from the World-Spectator during the meeting, Twin Valley Board Chair Jim Boucher said the board will take a closer look at its decision. “In all fairness, absolutely we will go back and rehash this,” he said.